"Gathering Data from Wedding Wire Made Easy!" Built upon my successful Local Scraper software, Wedding Wire Scraper lets you dig down into WeddingWires's Data and automatically gather business details for yourself. We collect 14 fields of data from WeddingWire.com and 3 different ways for you to drill down to exactly the data you are looking for. Making exact targeting simple and easy to do. 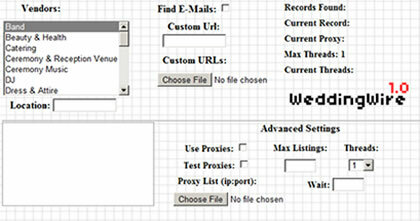 Wedding Wire Scraper is perfect for lead generation, list builders, and directory sites. Scrapped data will be automatically saved into an easy to use CSV format ready to import into your CRM or Spreadsheet editor. Looking for Emails? Not a problem our built in Email Hunter system will visit the company's website and root out any emails for you if it finds them. Here is the data you could be scraping from WeddingWire.com. Order now and get instant access to the greatest version of Wedding Wire Scraper yet. Get Instant Access to Wedding Wire Scraper for only $39.99! * Wedding Wire Scraper only supports Windows OS. ** Your purchase is for a Single License of Wedding Wire Scraper. Your Single License allows you to install the program on two computers.